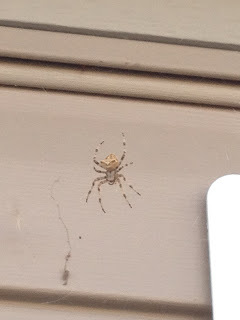 Spiderzilla had made a massive web just outside our garage door above my husbands motorcycle that I managed to miss until RIGHT before I almost walked through it. 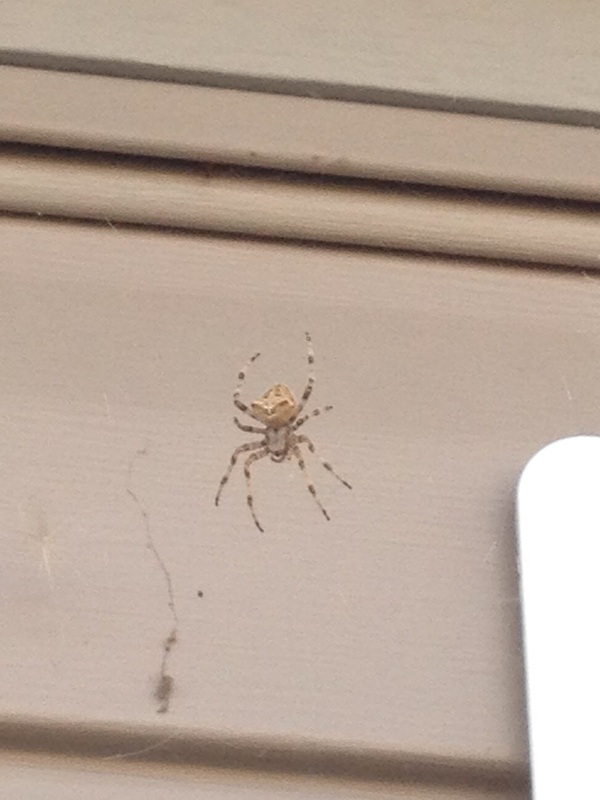 After I took this picture I promptly took the garage broom to the web and tossed him somewhere in our front yard grass. Didn't want to kill him, just didn't want to see him again! Oh my goodness has it ever been a long time since I have done anything with One Flower Wednesday - and I did a super quick check and the last time was on September 28, 2011.....almost exactly one year ago. WOW - how could a full year have gone by without me touching my hexies?! I was thinking that I wanted something that I could do with the kids around that wouldn't take up half the bonus room and it dawned on me that I still have my Christmas table runner that I started last year that I could bring out. I have no idea how big its going to be or what shape its going to take but I have fallen back into love with it so we'll see how it evolves over the next few months! I did recruit some "help" to cut more of my paper hexies out - don't worry the girls' hexies were going into a speical pile far far away from the ones that I was cutting out and being very careful with!!! Miss S actually did a really good job with cutting hers out - sometimes she blows my mind with how fast she is growing up!! She cracks me up - seriously, what a kid!!!! Hopefully I can get another flower done next week for my 'garden' and now I need to go post this over at Journey of a Quilter for her One Flower Wednesday sign up!! First time in a year for me! Yippee! After at least two months of not being able to upload any pictures because our hard drive was too full on the laptop I was finally able to download a ton of pictures today! My lovely, wonderful, amazing husband got the two external hard drives to do whatever they needed to do and with the additional purchase of Adobe Photoshop Elements 10 I now have a pretty sweet way to manage all my pictures on the big computer upstairs! I won't unload all our summer pictures on you at once but here are a few that I fell in love with as I was downloading them. Miss L on our "Mount Splashmore". My Sister got the kids a huge inflatable bouncy house that turns into a waterpark thing when you attach it to the sprinkler. Unfortunately its a pain to dry out so we only set it up and put water in it a few times this summer but we have been blowing it up for the kids to slide down and bounce in dry and they quite enjoy it. My beautiful Miss S, I took this with the new camera when we were camping this past weekend. Shes such a little cutie. Mr. C - I totally can't call him Baby C anymore. Hes 13 months old, walking and gets into all kinds of TROUBLE!! I took this picture of him when we were camping this past weekend as well. It drives my husband nuts that there is a big tree in the foreground but I love this picture - Mr. C just looks like hes getting ready to make a break for sweet freedom and trouble! I am SO happy to have my new camera AND an awesome way to now store all our photos.....and by all I mean we have a ton....I seriously need to go though them and get rid of all the duplicates, blurry ones, finger shots and all the "why did I take pictures of my feet" pictures but thats for another day. I did manage to get a little sewing done today but I'll save that for tomorrow! 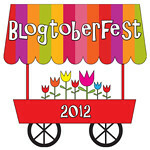 I must say that I love, love, LOVED Blogtoberfest last year. I think I did 29 days of it or something which for me is amaze-balls and I was pretty happy with myself for blogging almost every day! I haven't been able to find the 2012 sign up "sheet" but I keep looking for it - and worse comes to worse I will make my own button and sign MYSELF up! 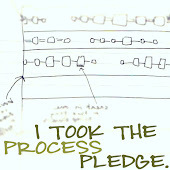 ;) I'm hoping to blog every day and have at least half of the days related to something sewingísh. Might have a few days of fun pictures that I want to share thanks to my awesome new camera that my husband got me for my birthday last week. I did however dig out a few WIPs that have been haunting me lately - the Eye Spy quilt is still quite a work in progress but I can't wait until its done, my kids are going to love it. The Domestic Handbag quilt has me in a bit of a quandry trying to figure out how to square up all the blocks since I didn't piece them all the same size. The last quilt that I REALLY need to finish is the Crazy Cat quilt, I started it over two years ago but I keep falling out of love with it which is sad since its super cute and I need to finish it to give it to my Mom! Hopefully Blogtoberfest will give me the kick that I need to get these projects finished or at least make some serious headway with and get back into the wonderful world of blogging more. Until next time my friends - sorry no pictures today. Hopefully tomorrow I will have some to share! Well, its now almost the end of September and hopefully life can slow down for us since Birthday Season is over (for our family at least but we are still smack dab in the middle of prime extended family birthdays for the next few months), although Miss S has her friend birthday party on Sunday but since its at a bowling alley and not involving me massively cleaning my house I'm not too concerned about that party! 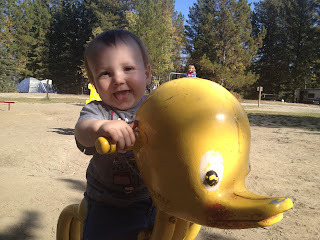 Mr. C really enjoyed playing at the park and had a ton of fun on the bouncy ducky!! Now its time to put Mr. C to bed, partially unload the trailer, do a TON of laundry and get some sleep before having to start the week off with Monday morning tomorrow. Today is the last birthday in our house for the 2012 year - and its MINE! My husbands birthday is in January, Miss L is the end of July, Mr. C is the end of August, Miss S is the 15th of September and mine is today (September 19th). I love birthdays but when birthday season starts in July its go go go go go and we have four family birthdays within the span of 53 days! Its the new Canon Rebel T4i and I can't wait to figure out how to use it! We had been tossing around a few different cameras but we liked how this shot good video as well as took amazing pictures so the Rebel won out. 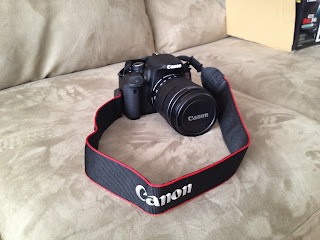 Hopefully my husband can offload our 8000+ pictures (what can I say - I like to take pictures!!) to our external hard-drive soon so I can actually start to download all the fantastic new pictures that I can't wait to start taking! Our laptop is past capacity and needs a serious cleaning/wiping/scrubbing since it has zero room for any new programs or pictures which is seriously hampering me uploading photos lately! We are off camping this weekend with our three kids, my two nieces, nephew and my mother in law - wish us luck! I'm hoping to share some picture of that when we get back - and I seriously need to get to work on my Domestic Handbag quilt since its due for my SIL in a little over a month! Ever have one of those days where you feel like time is just grains of sand slipping through your fingers far too quickly? I guess I'm having one of those days. I knew life with three kids (5, 3 & 1) would be busy, and I do love them all to death I just have no idea how to manage life so I can get it all done! Between cleaning, laundry (the never ending laundry!! ), meals, school - both kindergarten and preschool, grocery shopping, organizing my house and trying to play/get one on one time with each of my kids done every day is the master juggling act that I feel like I'm failing miserably at. Ok to say I'm failing miserably is probably taking it a little too far - my house does NOT look like something out of Hoarders nor does it look like something that Martha Stewart would be proud of! My kids are always in clean clothes, are happy, and most of the time get pretty good food to eat (although McDonalds has been visited far too much in the last week because I have been so sick with this darn cold to feel up to making dinner a few nights). I think I just need to find my groove and now that the girls are in school I can actually make a real plan to get stuff done (like a major purge of my kids clothes that they have all grown out of recently - what is it with siblings needing brand new wardrobes at the same time?!?) and then I can cross items off "The List"
Sorry, I feel like this has been one long rambling post. Mostly I just feel like I needed to write some stuff down to figure it out so if you have stuck with me for this long I should at least reward you with a sewing picture! 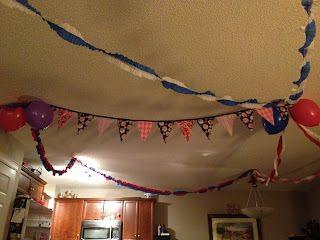 ;) As I said earlier it was Miss S's 5th birthday this weekend and she requested that we put up a LOT of the DIY Streamers even the 'boy' coloured ones, she just wanted the party to be colourful and happy (lord I love that little girl). So I made a few more streamers to add to our little collection and we have 7 different streamers taped to various parts of my ceiling (it looks like a streamer factory blew up in here but the kids liked it!). 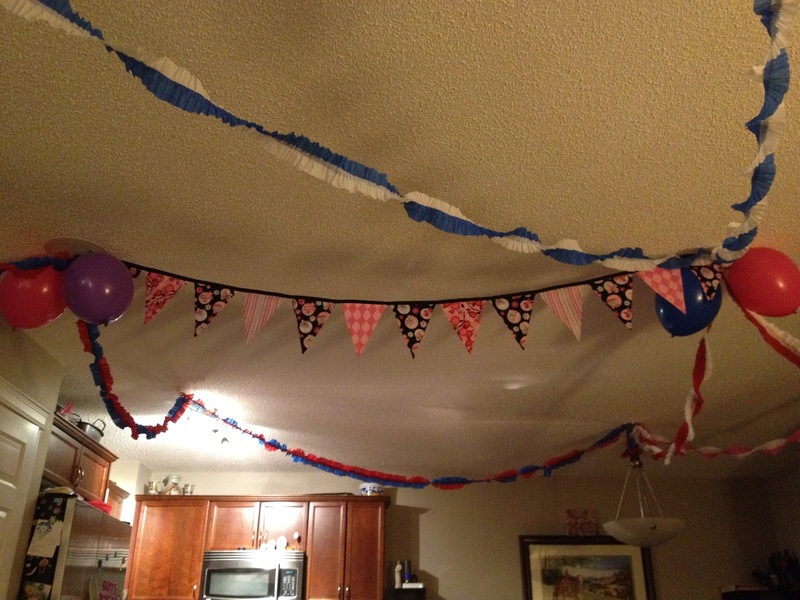 I also made the bunting in the picture below. I've been eyeballing them all over the internet and finally decided to make one and I love how it turned out. I think I'll be making a few more of these for future parties!